Let your true colors show through with clear acrylic bins. Clear Acrylic Gravity Bins will stand out and attract attention. 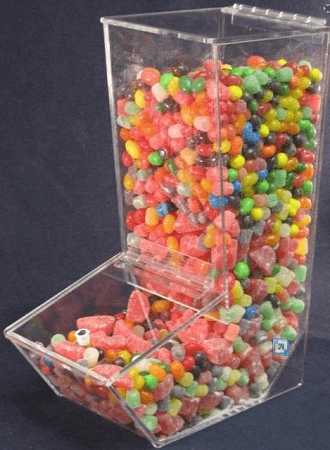 Fill with jelly beans, gummy bears or any small candy and customers will gravitate towards these containers. Acrylic containers aren't just for candy. They work well for any number of dry products from ice cream toppings to coffee beans or even small hardware items such as nuts and bolts. Uses for gravity bins are endless. Whether you have a counter display or a wall display these containers will let you make the most of the space you have. Order today at All candy Containers.